Hi STRANGERS! Haha, again, I must apologise for my current sabbatical - I'm currently on holiday from work and the time is going so quickly. I feel that trying to find the time to sit down and paint my nails followed by an accompanying blog post is like an impossible dream - but alas here we are, yay! I also have a few more lined up for you too (it rained today and I haven't moved away from my Helmer!) 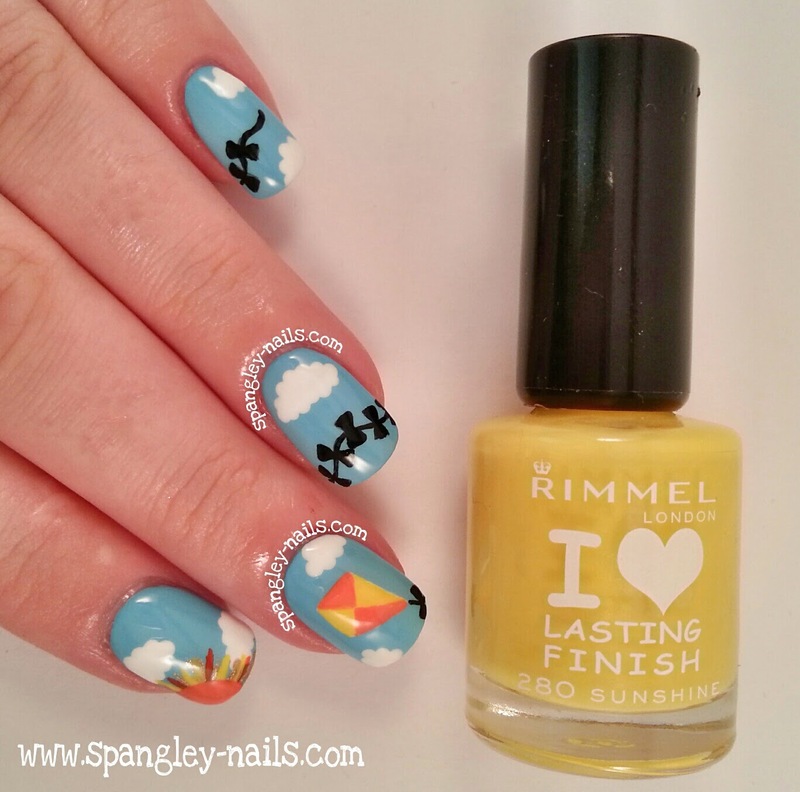 I am catching up on #NailArtJul and todays post will be for Day 10 - Sunshine. 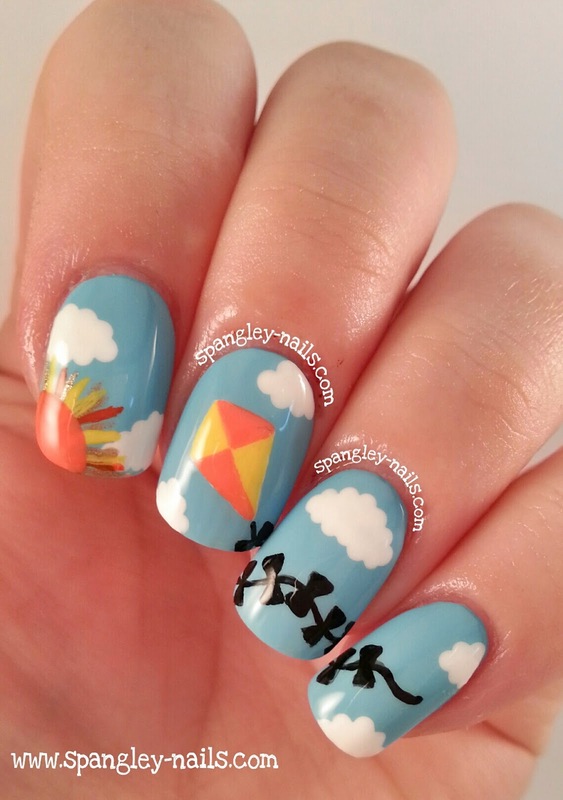 I seen a really cute Kite design on Pinterest by +Chalkboard Nails, I knew it would be perfect inspiration for this day. I started off by painting all of my nails with Too Cool To Tango - actually the perfect baby blue - goes on like a dream, I love it. Next, using Snow Me White - my new favourite white - and my small dotting tool, I dotted on some random clouds across each nail. 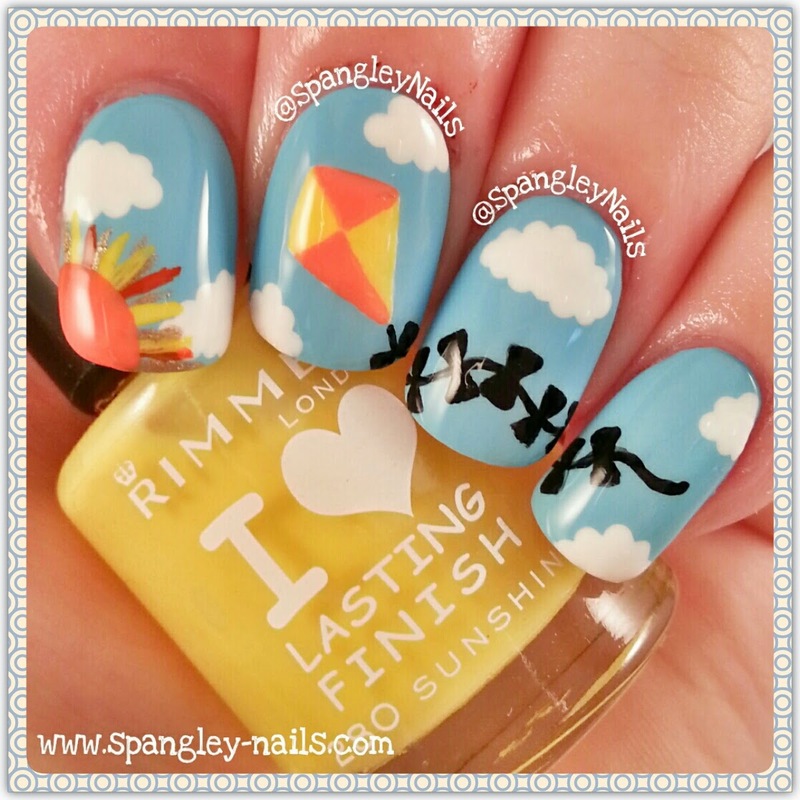 For the kite, I made a diagonal diamond shape on my middle finger with Snow Me White then filled in sections with Sunshine and Fuzzy Peach. For the ribbon, I used my small striping brush with Onyx and freehanded a random line coming out of the bottom of the diamond. To finish it off, I went back in and added 2 small triangles every so often to act as bows on the ribbon. Finally, I drew a semi-circle with Porchester Place on the bottom of my index finger the added different sized lines in Orange, Its Obvious, Gilty Pleasure and Sunshine coming out of it. Its all topped off with a coat of Seche Vite.